Lake Lure is a great resort area just a short drive from Asheville North Carolina where many seeking mountain homes, second homes or vacation homes will choose as their perfect new home destination. Lake Lure homes are available for immediate purchase so please call Green Mountain Realty today at 828.215.9064 for all of your home, land or real estate needs here in the Asheville NC areas. I have a question about the property at Tract 3 Old Sand Branch Road Lake Lure NC 28746 (#3416914). I would like to schedule a visit for the property at Tract 3 Old Sand Branch Road Lake Lure NC 28746 (#3416914). I have a question about the property at Tract 4 Old Sand Branch Road Lake Lure NC 28746 (#3417050). I would like to schedule a visit for the property at Tract 4 Old Sand Branch Road Lake Lure NC 28746 (#3417050). Perched above the north end of Lake Lure and overlooking Rumbling Bald Resort, this contemporary masterpiece offers breathtaking lake and mountain views from nearly every room. Positioned on over 7 acres including waterfront with covered boat slip, deck and dock. Outdoor stone patios with covered cook-center including gas grill, gaucho wood burning grill, sink, concrete countertops and hot tub. Each bedroom has a private en-suite full bath and offers access to the outdoors. The gourmet chef's kitchen has two Sub-Zero refrigerator/freezers, a professional Viking 6-burner plus grill cooktop with stainless hood. Quartz countertops, center island with prep sink, lots of pantry space and half bath. The large dining room just off the kitchen offers glass windows and doors on two sides allowing for stunning views and ease of access to the outdoor patio and kitchen. The sweeping great room with vaulted ceilings, wall of glass windows & large fireplace provide a lovely gathering area. I have a question about the property at 161 Waterside Drive Lake Lure NC 28746 (#3418533). I would like to schedule a visit for the property at 161 Waterside Drive Lake Lure NC 28746 (#3418533). Don't miss this once-in-a-lifetime opportunity to own a rare pristine acreage in the heart of picturesque Lake Lure. Bordered by NC Conservancy and Chimney Rock State Park lands, this 185.31 +/- acres has wide open pastures and clear mountain streams that are perfectly suited for locating your estate home or equestrian pursuits. Surrounded by breathtaking mountain views, this fabulous find is located adjacent to the world class Rumbling Bald Resort on Lake Lure which features two championship golf courses, 3 restaurants, 4 swimming pools, a private beach and marina, Wellness Center and much more. Completed plans and studies of potential single and multi-family development have been drawn as well as a complete topography of the property. Create an exceptional life starting here. See MLS #3348079 for additional opportunity. I have a question about the property at Kings Drive Lake Lure NC 28746 (#3349817). 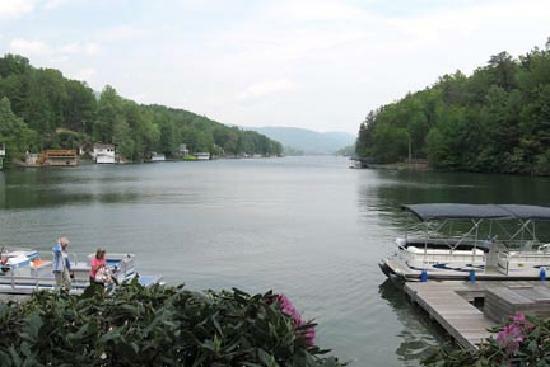 I would like to schedule a visit for the property at Kings Drive Lake Lure NC 28746 (#3349817). I have a question about the property at 196 Yacht Island Road Lake Lure NC 28746 (#3369189). I would like to schedule a visit for the property at 196 Yacht Island Road Lake Lure NC 28746 (#3369189). Yacht Island Lakefront. Sun-drenched with unparalleled Western views. Every area of this homes indoor and outdoor spaces capture the stunning waters of Lake Lure along with amazing long range views of the Hickory Nut Gorge mountain range and Chimney Rock Park. 5 bedrooms, 4 baths and outdoor spaces everywhere. Double boathouse, w/lifts, huge party deck, floating swim dock, additional patios,decks, a sunken 6-person hot tub to enjoy the most spectacular sunset views on the lake. Built in 1987 and continually upgraded, you won't be disappointed. Additionally, there is a separate 1 bedroom 1 bath lofted Guest Cottage, not listed in the home's square footage, Ample parking for 7 cars and a storage shed/workshop. All of these just minutes from shopping and activities. This property would work for either year around living, a second home or a vacation rental investment. Yacht Island is the only island on Lake Lure. Expansive Western views are the views of choice. Sunsets are amazing. I have a question about the property at 206 Yacht Island Drive Lake Lure NC 28746 (#3436904). I would like to schedule a visit for the property at 206 Yacht Island Drive Lake Lure NC 28746 (#3436904). I have a question about the property at 128 Sunset Lane Lake Lure NC 28746 (#3483926). I would like to schedule a visit for the property at 128 Sunset Lane Lake Lure NC 28746 (#3483926). I have a question about the property at 183 Yacht Island Drive Lake Lure NC 28746 (#3404117). I would like to schedule a visit for the property at 183 Yacht Island Drive Lake Lure NC 28746 (#3404117). I have a question about the property at 400 Kings Drive Lake Lure NC 28746 (#3497620). I would like to schedule a visit for the property at 400 Kings Drive Lake Lure NC 28746 (#3497620). This exquisite legacy estate is rich in history and breath-taking vistas. Originally designed and built by the Cheek family, heirs of the Maxwell House brand, and refined by Rolland King, Master Developer, this estate is perfect for the connoisseur of life. The Main House features a two-story great room featuring 270 views of surrounding mountains and stream via floor to ceiling windows. The Guest House & Lodge have a full kitchen, wet bar, and large recreation room and stone fireplace. The adjacent 4-car carport connects to the Caretaker's Cottage. There are also 2 barns with plenty of storage and livestock pens along with a 3-car garage and workshop. Whether watching the mountain fog lift as the sun rises or the nighttime display of fireflies come out on a summer evening, this pastoral estate is the perfect place to retire, relax and pause for the beauty tucked in the heart of the Blue Ridge Mountains. See MLS #3349817 for adjacent opportunity. I have a question about the property at 400 Kings Drive Lake Lure NC 28746 (#3498046). I would like to schedule a visit for the property at 400 Kings Drive Lake Lure NC 28746 (#3498046). I have a question about the property at 122 Eagles Crest Way Lake Lure NC 28746 (#3434019). I would like to schedule a visit for the property at 122 Eagles Crest Way Lake Lure NC 28746 (#3434019). I have a question about the property at 2175 Buffalo Shoals Road Lake Lure NC 28746 (#3458926). I would like to schedule a visit for the property at 2175 Buffalo Shoals Road Lake Lure NC 28746 (#3458926). I have a question about the property at 379 Lurewoods Manor Drive Lake Lure NC 28746 (#3321666). I would like to schedule a visit for the property at 379 Lurewoods Manor Drive Lake Lure NC 28746 (#3321666). The quintessential lake house. This well thought out spacious home is perfect for relaxing weekends with the family and sun-drenched days on the water. The tastefully designed gourmet kitchen has SS appliances, a center island and beautiful granite counters. The posh Master on Main includes His and Her ensuite baths with an infrared sauna while the upper level guest rooms offer lake views in refined comfort. Don't miss the gorgeous sunset over the mountains of sparkling Lake Lure. I have a question about the property at 275 Deerwood Drive Lake Lure NC 28746 (#3353135). I would like to schedule a visit for the property at 275 Deerwood Drive Lake Lure NC 28746 (#3353135). One owner Custom Lakefront home of distinction. PRIVATE. Magnificent Sunset views from every room! Large 2-bay Boathouse with lifts, side deck & new sundeck on Deep water. Abundant natural light. Artisan and European influences throughout this Private Lakefront Home. Great Room Wood Ceiling 17' at center. Clerestory Windows. Octagon Dining Room adjoins open Kitchen, Great Room & Screened Porch. Ease of access: Drive to your front door. Custom cabinets. Granite Counters. English Shaw Farm Sink. Authentic built-in late 1800s French Butcher table serves as Breakfast Bar. Wine bar. Custom Ceramic Kitchen Back splash depicts Lake and Mountains. Custom wood mantel. Oak Floors. Art studio, potential Library or Game Room. Gas Grill connected to Propane tank. Rennai On Demand water heater. Generator. Low maintenance property. 2010 Bennington Pontoon and Canoe negotiable. I have a question about the property at 324 Snug Harbor Circle Lake Lure NC 28746 (#3423683). I would like to schedule a visit for the property at 324 Snug Harbor Circle Lake Lure NC 28746 (#3423683). I have a question about the property at 2150 Cedar Creek Road Lake Lure NC 28746 (#3346197). I would like to schedule a visit for the property at 2150 Cedar Creek Road Lake Lure NC 28746 (#3346197). I have a question about the property at 2150 Cedar Creek Road Lake Lure NC 28746 (#3316131). I would like to schedule a visit for the property at 2150 Cedar Creek Road Lake Lure NC 28746 (#3316131). I have a question about the property at 2385 Buffalo Shoals Road Lake Lure NC 28746 (#3271953). I would like to schedule a visit for the property at 2385 Buffalo Shoals Road Lake Lure NC 28746 (#3271953). I have a question about the property at 164 Neighborly Drive Lake Lure NC 28746 (#3492772). I would like to schedule a visit for the property at 164 Neighborly Drive Lake Lure NC 28746 (#3492772).